US, 2011, 90 minutes, Colour. Brit Marling, William Mapother, Richard Berendzen, Kumar Pallana. Astronomists discover another planet which begins to loom large in the sky. They call it Earth 2. A teenage girl is fascinated by the planet, gazing at it, wondering – until she recklessly crashes into a parked car, killing a child, the pregnant mother and putting the father into a coma. The main action of the film takes place after she is released from prison. She is still fascinated by Earth 2 and writes a short essay for a competition for a place on a shuttle to visit the new planet. She also has a sense of shame and guilt and applies for a job cleaning a school. News that the father has come out of coma leads her to visit him, offering to do the cleaning for him. This is a small film with a small budget. However, it works well as a character study of the girl (Brit Marling who also collaborated on the screenplay), her relationship with the man (William Mapother) and her not revealing the truth to him. This is a tension in the background, and sometimes foreground, through most of the film. The resolution of the problem is somewhat unexpected but works within the themes being explored: grief, anger, shame, love, self-sacrifice. There is also an enigmatic final scene which leaves the audience with some thinking and puzzling to do. The girl has said that when the planet was first observed with its resemblance to earth, synchronicity was shattered. Is Earth 2 a parallel world to Earth? That is one of the final questions – and if so, do we have doubles, and is there a parallel and better life there? No answers, just a suggestion. The film was released at the same time as Lars von Trier’s Melancholia. With a planet near earth, there are quite some similarities, but quite a different perspective. 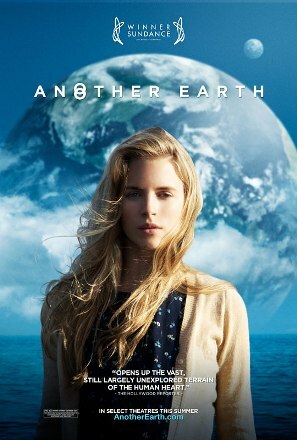 Another Earth is modestly ambitious in its themes and scope and succeeds. 1. The acclaim for the film? Small-budget? Tackling cosmic issues? Apocalyptic but positive? Alter-egos and alter-Earth? 2. The production values, the small cast, the locations, the special effects for a alternate Earth? The musical score? 3. The presupposition about a new planet, being a mirror planet? Earth Two? The visuals for it being in the sky, continually present? The response of the scientists, Dr Berendzen and his remarks? The exploration of the planet? The preparations for the trip? Science development? Space development? 4. The focus on Rhoda, young, interested in astronomy, the party, driving home, the discovery of the planet, listening to the radio, distracted? The crash? Her being injured but not dying? John and his family, the wife’s death? 5. The scene in the car, John and his wife, the son, their discussions – and the suddenness of the accident? 6. Rhoda, leaving jail, going home to her parents? Their concern for her? Her settling in? The effect of what she had done, of the jail time? 7. Her going to get a job, discussions about employment? Going to the school, becoming a cleaner? The details of scenes of her cleaning? The effect? The other members of the staff? Paulida and listening, advice? 8. Her decision to go to John’s house, her knowledge of him, research about him, his coming out of coma, his musical background? 9. Visiting him, his manner, alone? Her offering to clean the house, the test? In the house, looking around, trying to understand John? His inviting her back? 10. Her travelling to his house, the regular cleaning, getting to know him better, sharing with him, drink? His getting to understand her? Her ambitions, the talk about the planet? The sexual encounter? The effect on John, on Rhoda? The audience wondering all the time when she would tell him the truth? The potential for hurt for him? 11. Her writing the essay, the competition? Sending it in? Her explanation to John? The letter, her brother and the parents, her being chosen? The contact made? The TV news? 12. John and his learning the truth? The reaction, his bitterness, ousting Rhoda? Her humiliation, grief? 13. Her decision to offer the trip to John? As recompense, self-sacrifice? 14. His acceptance of the trip, his experience, his gratitude to her? Her hope that he would find his wife and son in the alternate planet? 15. The ending, Rhoda suddenly seeing her alter-ego? Leaving the situation up in the air – for the audience to ask questions about alternate worlds, other planets, identity?